MURAL BY WOODEN WAVE X MEGGS AT SHORT N' SWEET HILO. MURAL BY LAUREN YS AT THE HILO TOWN TAVERN. 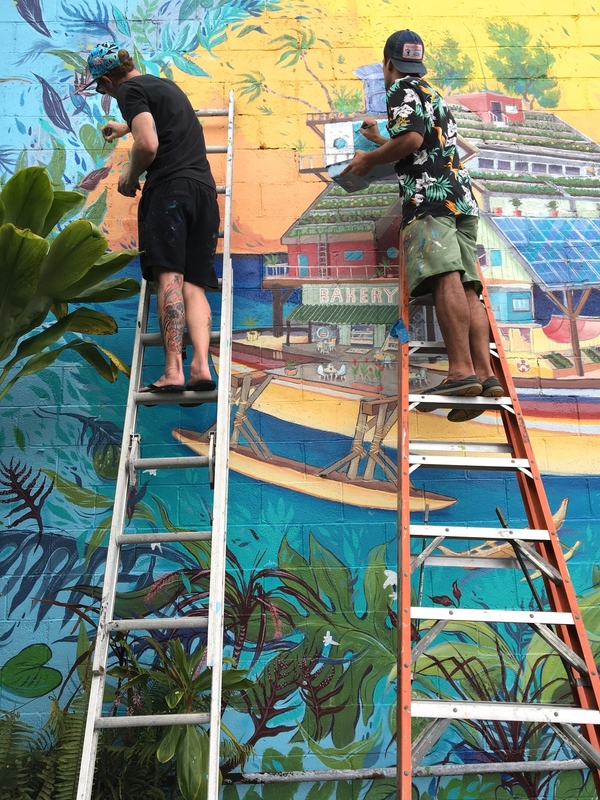 Our first official residency project featured visual artists Lauren YS and Wooden Wave, who painted sustainability-themed murals in Hilo, Hawai'i. 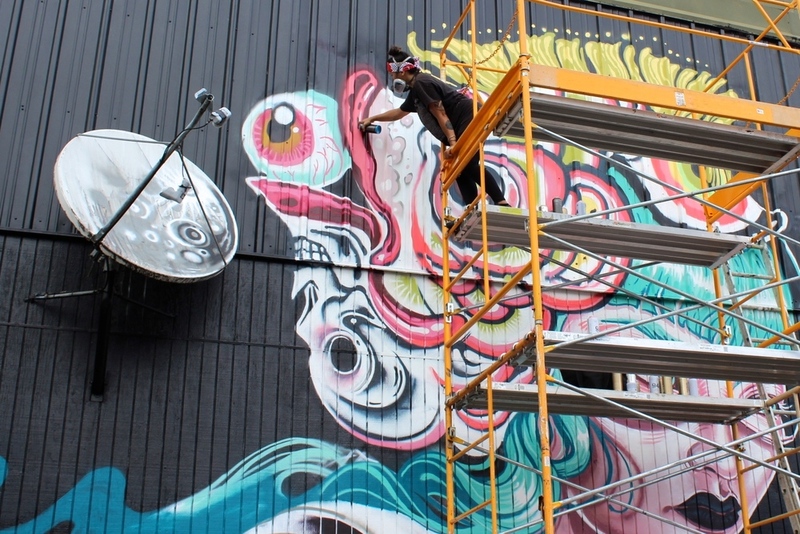 Oakland-based artist Lauren YS painted the entire side of Hilo Town Tavern on Keawe Street. 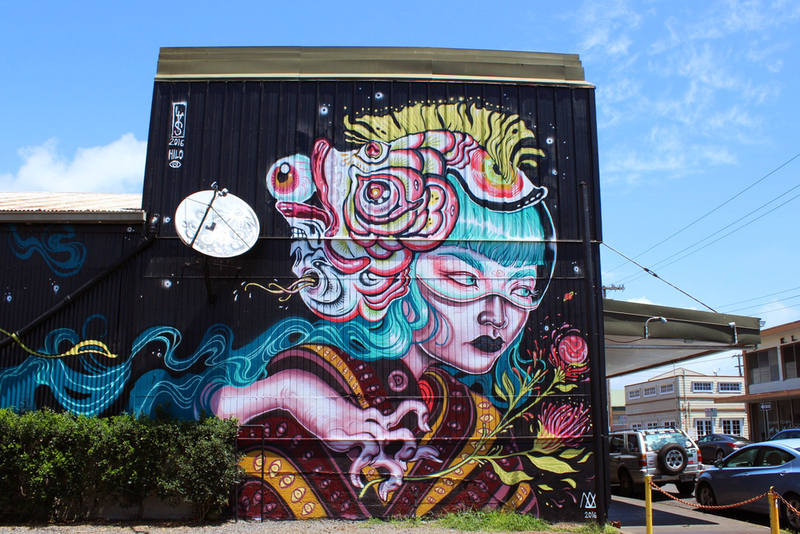 Her mural, titled 'Piscean,' is a fantastical portrait of her younger sister Dani as a cyber-hybrid space biologist traversing a sustainable future dreamscape. Dani interned at NASA with a focus in researching plants that could sustain life on Mars and just graduated with her degree in astrobiology, so Lauren congratulates her by painting her portrait as a sea-witch with a Piscean space-helmet scrutinizing the local flora for its nutrient content. Lauren travels the globe painting murals and exhibiting her work. We had the pleasure of traveling with her for nearly three months in New Zealand, Australia, and Hawai'i, and her passion to influence her audience in a positive light is why she fits perfectly into our Temple Children community. Kalamakua translates to the idea of bearing a torch for the next generation, or carrying a light, which enhances the overall theme of the artwork, “Innovating for 100%.” The larger boat is outfitted with various permaculture and energy creating systems that would conceivably meet the needs of an eco-conscious, fun-loving, ocean-bound community. Included among these systems are solar panels, water collection/storage, aquaponics, terraced roof-top gardens, and a bakery built in mid-century modern architecture, a nod to Hilo town's vibrant mom and pop businesses and the history of Short N Sweet Hilo’s building. The smaller canoe is a Hawaiian style wa‘a – an homage to the cultural significance of Hawaiian seafaring, and an exultation of the iconic historic landmark. 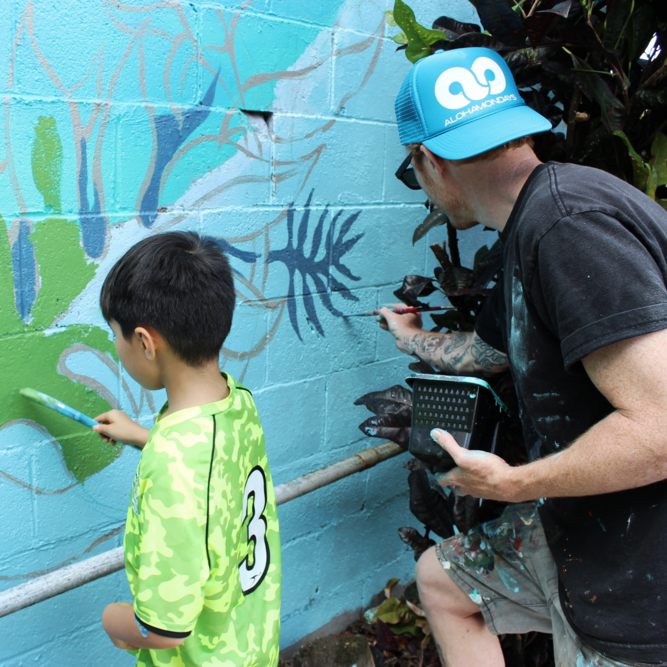 The artwork also features native Big Island flora and fauna, as the piece would not be complete without some "major greenery," as Matt claims. Aside from the mural painting, we enjoyed our pau hanas and visits to waterfalls with Lauren, Matt, MEGGS, and crew. Many thanks to our Regional Director Ashley Kierkiewicz, Energy Excelerator, HPM Hawai'i, Maria and Dien Short, Issa Hilweh, Aloha Made, Oasis Skate Co., Montana Colors Hawai'i, Aloha Mondays, Moon & Turtle, Zoe Kaneshiro, Rebecca Keolanui, and Kim Tsukazaki for all of the support and generosity! Mahalo to Adam at Vision Horse Media for the videos!